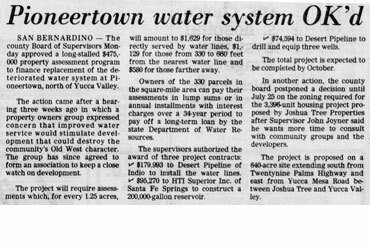 SAN BERNARDINO – The county Board of Supervisors has levied fees of $125 an acre on Pioneertown property owners to pay off an $80,000 loan the board granted in June for emergency work on the desert community’s water system. The supervisors Monday heard no protests against the assessments as they also authorized Pioneertown’s square-mile improvement zone to accept a $520,500 state loan to help finance an entire new $1.3 million water system. Additional assessments will be required for that construction. The fees approved Monday will ensure repayment of costs of drilling a new well and connecting it with the community’s existing system, which officials said is inadequate and has been out of water periodically since early June. 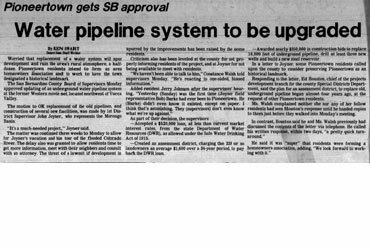 Special districts engineer Ed Houston said the new system now in early planning stages would include six miles of distribution lines, eight small wells and a reservoir. Approved annexation of the 12-square-mile Copper Mountain Mesa area, north of Joshua Tree, to the county agency that finances fire protection by the California Department of Forestry for many unincorporated communities. The annexation enables the CDF to help develop and supervise a volunteer fire department in the area. Called for a second round of bidding on an estimated $78,000 soccer field lighting project at Barstow’s H Street Park after rejecting nine offers on the work as the result of defective bids and misunderstandings among contractors. 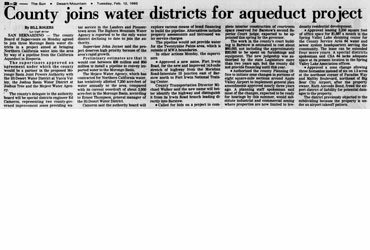 Scheduled a hearing for 9 a.m. Aug 25 on a proposal to abolish the Palm wells County Water District which was formed in 1962 to develop a water system for an area of some 400 acres on the eastern outskirts of Morongo Valley. The Local Agency Formation Commission recently recommended that the district be dissolved because it has never provided water service and its board has been inactive in recent years.